During term 3, (25-7-11 till 30-9-11) Marianne conducted a ten-week Artist in Schools program at Isabella Plains Early Childhood School in Tuggeranong, Canberra. 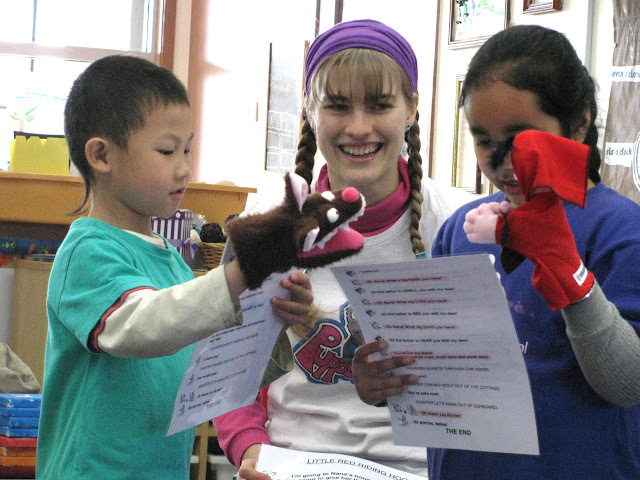 Marianne created program based on her theme “Communication through Puppetry” that addressed several different types of communication from eye-contact to learning new ways to express themselves, all through the magical medium of puppetry (see the weekly activities below). 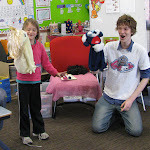 Each week students became more confident performing and talking in front of the class and excelled at puppetry techniques that can even take some adults years to learn. 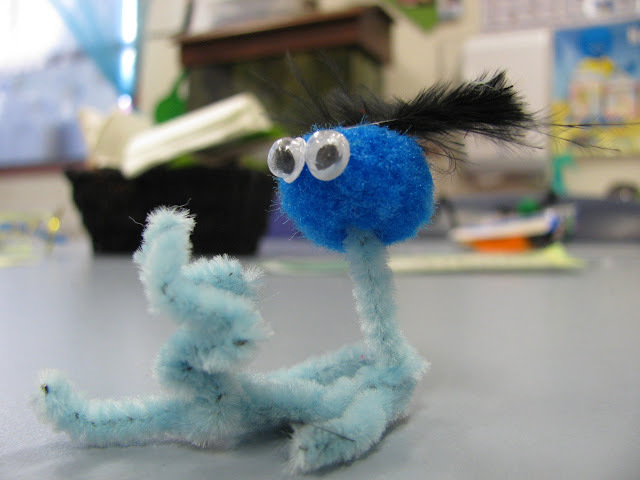 Teachers often reported that they would often find their students turning everyday objects into puppet creations during their regular playtime. During week one, students learnt the fundamentals of puppetry: "to bring any inanimate object to life through sound, movement and imagination." They also learnt about several different types of puppetry, such as stick puppets, sock puppets, string puppets, object puppets and finger puppets. Each student explored different types of ‘everyday objects’ and turned them into puppets (Found Object Puppetry) through using sound, movement and their imagination. Through these activities, students were able to appreciate objects beyond face value while stimulating and developing their imagination and creativity. During week two's session, students further enhanced puppet creations they'd made throughout the week with guidance from Marianne & Jonathan. 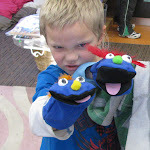 Each puppet was then brought to life full by applying six basic emotions (sad, happy, excited, scared, tender and angry). During the session, each student got the opportunity to 'perform' their creations with expression to the class. One after the other, each student lit up with pride and accomplishment to showcase their work. Although only the second week of the residency, even some of the more shy students were gaining the confidence to perform and talk through their puppets in front of fellow classmates. 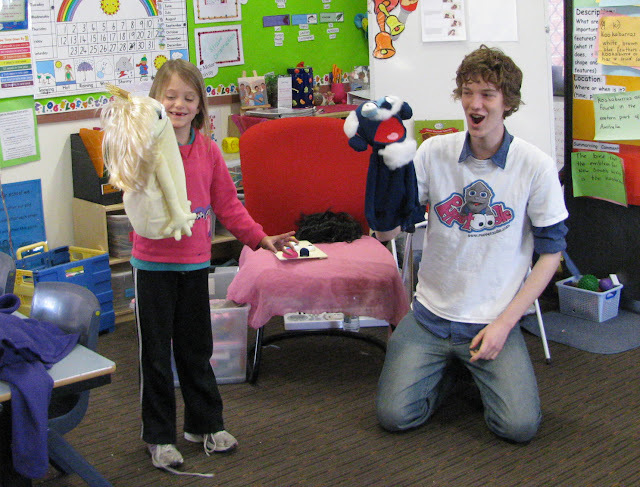 During week three, students learnt the importance of eye contact when communicating, both in puppetry and in everyday life. 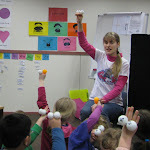 Students each got a pair of ping-pong balls that they were able to strap to their wrists in order to use their hand as a basic puppet. Students explored eye contact and various ways of expressing emotions through slight movements with their fingers and variations in eye contact and character sounds and voices. 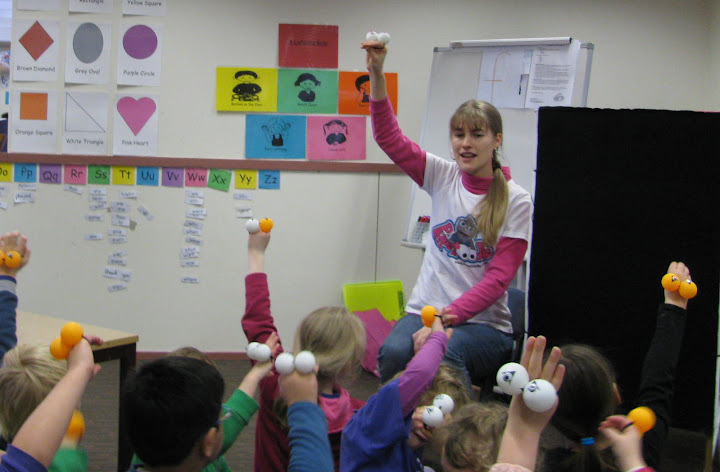 Students were also able to grasp and demonstrate complicated puppetry techniques, such as 'lip-syncing': opening and closing their puppet mouths at the right moments, while singing 'Mary Had a Little Lamb'. These sessions particularly benefited students with autism and communication problems, while other students learnt new words and vocabulary for expressing themselves and understanding the importance of clear pronunciation. 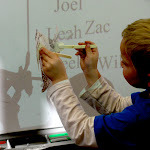 During week four, students explored the ancient puppetry form of shadow play. Through storytelling and movement, students were able to grasp and express feelings about bullying, rejection and inclusion. 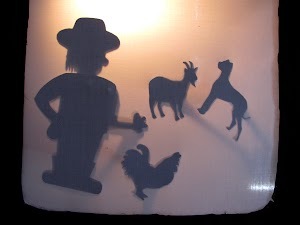 All students were able to perform a shadow puppet and were able to explore a different way to explore sound, movement and imagination through puppetry. 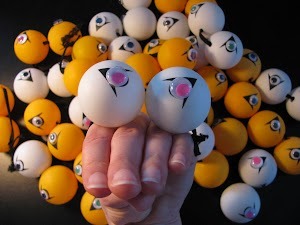 Older students also continued work on eye-focus, lip-syncing and learning and using new expression words with the ping-pong eye-balls and specially created emotion word categories. 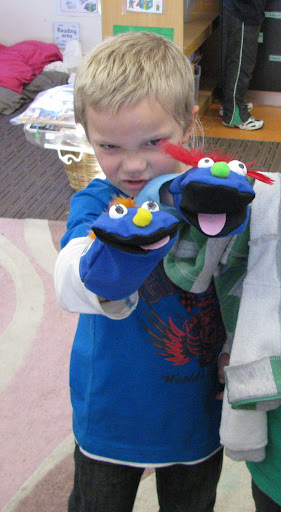 During week five, every student got the opportunity to make their very own hand puppet character to take home! An incredible 80 puppets were made over the course of the day - and each one unique. This was a very special week, since all the techniques and ideas that were worked on during previous weeks (movement, sound, imagination, emotions, storytelling and lip-syncing) were able to come together to make their hand puppets come alive. Older students also learnt the basic principals of how to read a script, using different character voices, stage directions and applying the right emotions at certain points within a script. 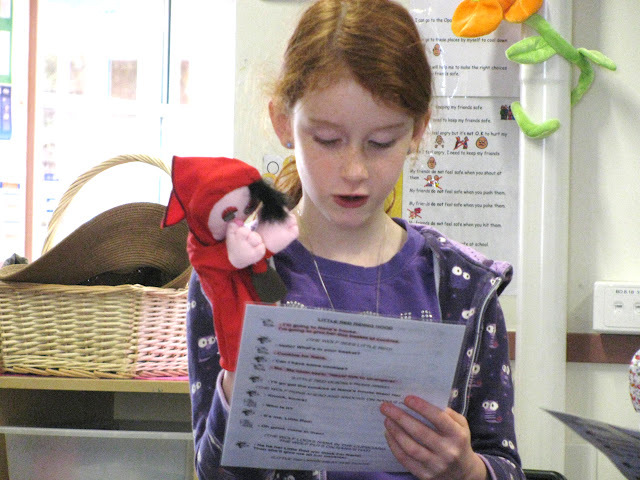 In groups, students read the script ‘Little Red Riding Hood’. During week six, the ‘Puppet Me’ concept was introduced. Each student created a puppet of themselves, using a photograph, paddle-pop sticks, pipe cleaners and various other decorations. 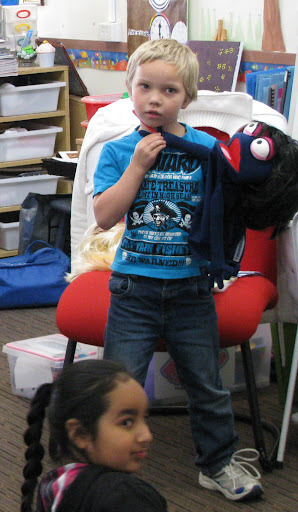 After the puppets were made, each student introduced themselves (through their puppet) to the class and talked about their passions and feelings. 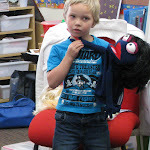 Even during the first session with one of the Kindergarten classes - the Puppet Me’s were already put to use, successful resolving a conflict between two boys. 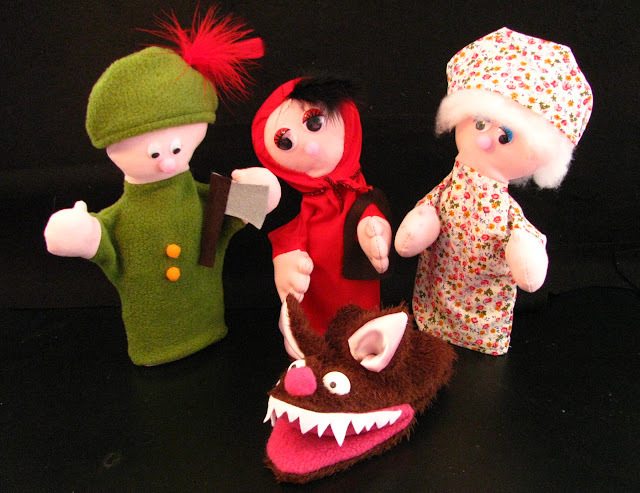 These puppets were kept in the classrooms with a set of basic instructions for the teachers. Suggestions and activities were also given of how to incorporate them into their lessons, to explain sensitive issues and at times when the students have difficulties expressing themselves. 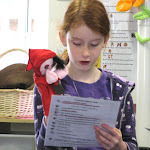 Older students also continued working on their script reading, but this week using actually Little Red Riding Hood hand puppets and in groups of four, took turns performing the story to the class. 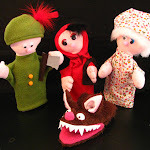 Week seven was all about understanding and practicing improvisation through working with the Little Red Riding Hood puppets and story. Almost all students had never heard of improvisation as a concept - so it was a very important exercise during the residency, as by the end of the sessions, students understood that they could incorporate improvisation skills in not only their puppetry performances but also everyday life. Older students also got the opportunity to create a ‘puppet town’ for their Puppet Me’s to live and work in. Each student created at least one part of the town, such as a building, truck, tree, etc. Then students took turns completing ‘missions’ in the puppet town, with their Puppet Me’s - such as; playing the role of the milk delivery man, taking the milk to the shop and navigating through particular streets. Through these activities, students gained basic knowledge into how communities worked, different people in different jobs communicated with each other and also practiced basic mapping and navigational skills. During week eight, students learnt and refined new performance techniques, such as projection. 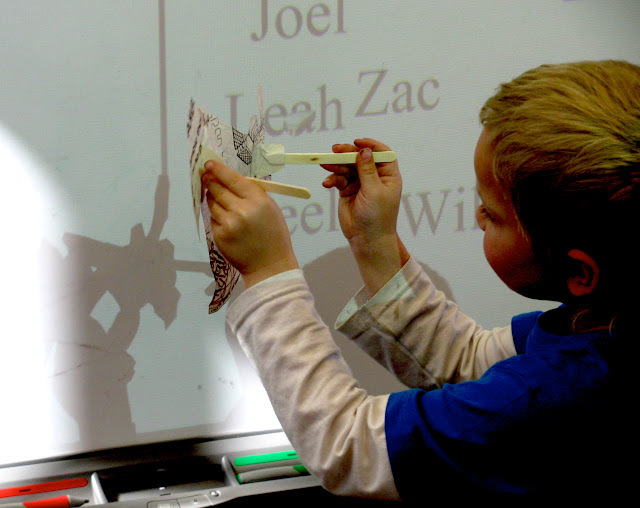 Throughout the weeks, it became clear that projection techniques was something every student could build upon - not only in their puppetry performances, but also in daily life and when speaking to larger groups. Through different exercises and activities, students gained confidence and become more relaxed performing in front of the class. Students also continued working on their improvisational skits, focusing of developing each of the characters in the Little Red story. Older students also got the opportunity to learn about Table Top Puppetry - a style of puppetry which is generally performed on top of a table with smaller puppets. Each student created their own table top stage and table top style Red Riding Hood puppets. During week nine, Marianne brought along her ‘No Face Puppets’ - large, blank puppets made from a special Velcro-like material that have interchangeable features, wigs, eyes and noses. As a group, students helped develop a series of unique characters that all had different voices, emotions and personalities. Through these activities, students learnt how to create different characters and how even the slightest change in appearance or personality can change a character completely. 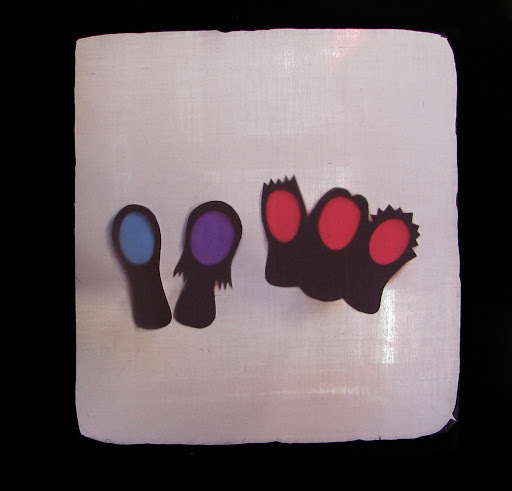 The younger students then used these techniques to created their unique finger puppet characters. The older students used these techniques to create characters for their own story that they wrote together as a group. During this activity, the students learnt and implemented the different aspects of story writing; such as a timeline, heros and villains, objectives and climaxes within a story and the beginning, middle and ending. Each student then interpreted the story written as a group and created their own version, drawings and story board. During week ten, the final week, students learnt about individuality and how important it is in puppetry and also in everyday life. 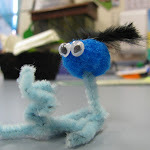 The younger students reflected on the individuality concept, by creating their own ‘wiggly worm’ puppet - that was as different and unique as possible. The older students continued the story project from the last sessions and brought their story to life through performance with the ‘No Face Puppets’. Each student got an opportunity to shine and perform their own unique take on the story that they had written themselves.. Supported by the ACT Government and artsACT.